Germany plans to increase its military commitment to Afghanistan by sending 500 extra troops, Chancellor Angela Merkel says. Germany currently has 4,300 soldiers in the country - the third-largest foreign contingent after the US and UK. The extra deployment will need parliamentary approval. German MPs are due to debate the issue on Wednesday. The announcement comes two days before an international conference in London on the future of the Afghan mission. As well as the 500 extra troops, Germany will prepare a "flexible reserve" of 350 soldiers who could be deployed to Afghanistan for a limited time, Mrs Merkel said. The focus of Germany's effort would be on training Afghan security forces and protecting civilians, she said. She said Berlin would also put 50m euros ($70m, £44m) into an international fund to win over more moderate insurgents, and increase its development aid to 430m euros per year - nearly double the current level. 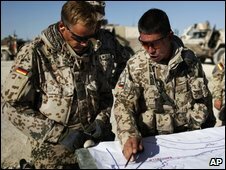 Germany, along with other Nato countries, has come under intense pressure to increase its commitment to Afghanistan, where the US is launching a "surge" with 30,000 extra troops to combat growing instability. Mrs Merkel said: "I think that if Germany plans to train at least one-third of the police forces in Afghanistan, if it doubles what it is doing in terms of civil reconstruction and we make our entire approach more effective and harmonise it with the international community, plus adds 500 troops and a flexible reserve of 350 troops, then we have nothing to be ashamed of." President Karzai: "Afghanistan wants to... reduce the burden on our international partners"
Mrs Merkel did not put a date on the withdrawal of German forces, but said she wanted Afghanistan to handle its own security by 2014. Later her Foreign Minister, Guido Westerwelle, said: "We want to start reducing our own contingent in 2011 and we want to complete the handover of security responsibilities to Afghanistan in 2014." Germany's troops are based mostly in the north of the country. The region was relatively peaceful, but the spread of the Taliban insurgency means they have become involved in more fighting. The mission is unpopular with the German public, especially since German forces called in a US air strike in September near Kunduz that left dozens of Afghan civilians dead. 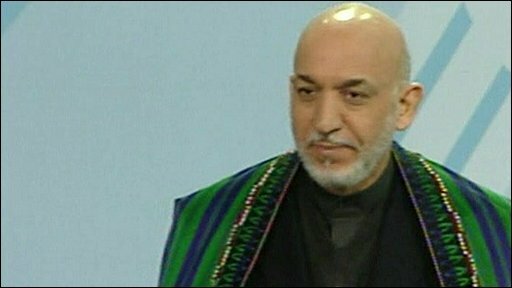 Afghanistan's President Hamid Karzai was due to travel to Berlin later on Tuesday, for talks with Mrs Merkel ahead of the London conference on Thursday.